River otters are in the Mustelid family, and are related to badgers, wolverines, weasels and skunks. They have adapted to an aquatic lifestyle of living on land and water. They are nimble runners, have streamlined bodies, short legs, long pointed tails, and webbed toes making them fast swimmers and agile on land. They have short thick brown fur that they frequently have to groom to distribute the oils that help keep their fur water resistant. River otters swim on their bellies at speeds up to seven miles per hour. To most successfully view river otters, find a spot higher up on shore to view the shoreline and look in the water near shore. Their hearing and sense of smell is well developed so it’s best to stay quiet and still when viewing river otters. Look for river otters along the rocky shoreline, especially in areas where streams or rivers meet the ocean. You can also look for the long, slender brown body swimming in the water. River otters are found in fresh, brackish or salt water and along shorelines. Watch for river otters at dawn as they leave their dens to hunt for fish and shellfish, or at dusk as they return. River otters might be seen at most sites around the Salish Sea. River otters can be found in stream, ponds, estuaries, lakes and coastal marshes throughout North America. River otters are often seen in open waters along the coast, contrary to their name implying a range solely in rivers. They are commonly seen along shorelines in the Pacific Northwest, especially at dawn and dusk. They can also travel on land for long distances. In coastal habitats, river otters are found in estuaries, marshes and the lower parts of streams. 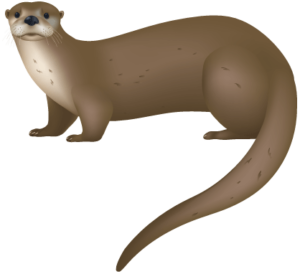 Inland, river otters are found in lowland marshes and swamps, streams and small lakes. Their dens are found in shrubbery along river banks, or in abandoned beaver, badger, fox or rabbit dwellings, and sometimes in the crawl spaces of human homes. River otters around the northwest coast are equally at home in marine and fresh waters. Since they spend so much time in salt water, there is some speculation that they are evolving into a new species. River otters become sexually mature at two years old. Mating occurs in the spring but river otters delay implantation of the embryo until the following winter. It is close to a year after mating that the female will give birth, with a gestation period of only 60-63 days. One to four pups are born March through May. Pups begin to play at four weeks and learn to swim at seven weeks old. The pup will eat solid food and explore beyond the den around eight to ten weeks of age. In the fall, the pups leave their dens and find their own territories. River otters are generally solitary but may spend time in family groups, usually consisting of a mother and her pups. The family group will construct dens in hollow logs, stumps, or using human made structures. The females drive off the aggressive males while the cubs are young. Males occasionally take part in rearing the young but usually male otters lead solitary lives before and after breeding. River otters vocalize, using an assortment of chirps, “chuckles” and growls. River otters are opportunists omnivores with a wide ranging diet, consisting primarily of fish. They usually hunt slow moving fish species such as carp and stickle backs, and have also been known to travel long distances to seek out salmon runs. They can dive to depths of 50-75 feet and remain underwater for up to five minutes while hunting food. In addition to fish, river otters expand their diet to include a variety of animals including crustaceans (crayfish and crabs), mussels, insects, reptiles and amphibians, birds, and even rodents. Since river otters are not considered marine mammals they are not protected under the Marine Mammal Protection Act. River otters were over-hunted in North America for their fur, and trapping still continues Washington and British Columbia. The population is rebounding from the low numbers left due to fur trading. Urban development impacts their habitat and prey availability the most. Oil spills, toxins in their food supply and fishing gear entanglements are also of concern. Humans trap otters to control fish predation and prevent damage on private property. River otters are mostly safe from predators in the water, however, when traveling on land they are vulnerable to predators such as coyotes, bobcats, domestic dogs, and cougars.